Finding whipping cream, getting my hand mixer and finally whipping cream at home. What a triumph it was all those years ago! I must admit, I have never really whipped or even tasted 'real' cream for some strange reason. May be some day when I taste the real thing I may insist you try it. Till now, it has always been the consistent, affordable, non-dairy cream which is commonly available. It may not be the most enchanting, billowy whipped cream purists talk about, but good enough. Non-dairy cream keeps well in the freezer, whips quite well even in summer, almost never fails you, making it a very safe bet. Here is how we go about whipping cream. Use any kind of cream you like as the procedure remains the same. Cream: The percentage of fat matters. 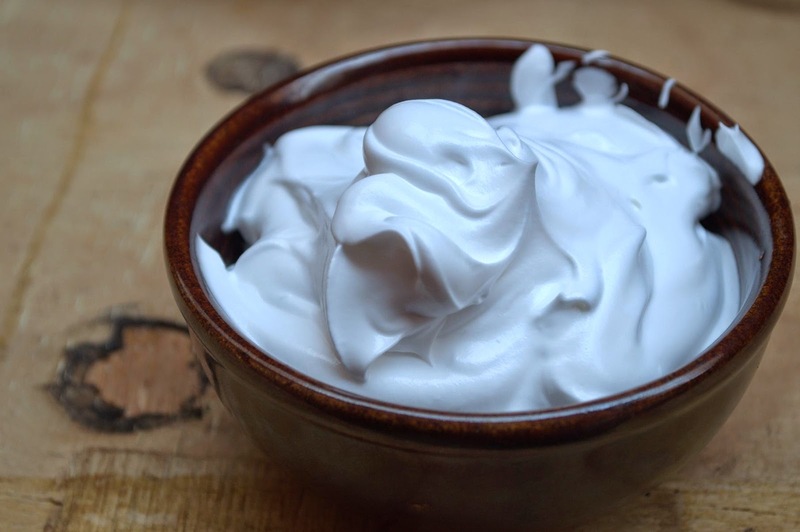 You could use non-dairy whipping cream such as Rich's, Tropolite, MerryWhip or GoldTop commonly found in most baking supplies stores. Amul (25% fat), locally available cream like Nilgiris (more than 30% fat I think) has also worked well for others. If using Amul, do refrigerate well ahead, drain the thin liquid and use only the chilled thick cream. You could also try imported heavy cream available at Spar and Godrej Natures Basket, but be warned, it doesn't come cheap. You could buy non-dairy cream which comes in 1 kg packs. If its just for occasional home use, divide and transfer the contents to smaller freezer safe containers, label the amount of cream ( 1 cup, 1/2 cup) and date. This should store well for about 2 months. Just transfer the box you need to the refrigerator and thaw for a few hours or overnight before using. What you will need: Plenty of ice! A hand mixer (not an immersion blender), a large bowl, one smaller steel bowl depending on the quantity of cream you want to whip. I have used a 4 cup capacity bowl to whip a cup (240 ml) of cream. Do not use a very small bowl as there wont be enough space to accommodate the volume. Chill the smaller steel bowl and the beaters (not the dough hooks) of your hand mixer for at least 20-30 minutes. Make sure the cream is liquid and really cold. All of the above will help get a good volume of cream. 1 cup of cream gave me about 3 1/2 cups of whipped cream. To Whip: First take plenty of ice in the larger bowl. Over the ice, place the smaller chilled bowl with the cold cream in it. The bowl needs to be surrounded with ice and sit snugly in it. Fit the chilled beaters to the hand mixer and whip the cream on speed 3 for about 3-4 minutes. You can see beater marks on the surface and when you lift the beaters, you will see soft peaks as in the picture below. The cream will mound softly when dropped from a spoon. This is good for serving alongside your dessert. You can make this ahead and refrigerate. If you need cream for piping and frosting a cake, you will need to whip for 3-4 minutes more (at the same speed 3) till it forms stiff peaks (below). DO NOT OVER WHIP. Fill immediately into a pastry bag and use. The time given for whipping is approximate, you may need more or less depending on the brand of cream, the atmospheric temperature etc. Practice will help figure out your texture preference and how much to whip. Please note: Cream beaten to stiff peaks and piped holds well only when refrigerated. You will need stabilizers if keeping the cake out at room temperature for long. If your cream seems stiffer than you need, try gently stirring in a little cream, a teaspoon at a time. Flavoring : You could add vanilla, rum or instant coffee dissolved in a teaspoon or so of hot water. But cool and chill the coffee before adding to the cream. You could also heat 2-3 tablespoons of cream, take off the heat and infuse the flavor of citrus zest or any spice and strain. Add to the rest of the cream and chill before beating. Be cautious and test first as once the cream had split when I tried heating it. It could have been the brand or just an one off case, but play safe. Stabilizing :Cobasan a liquid product from Germany is supposedly tasteless, easy to use and helps stabilizing whipped cream and buttercream so that it holds well for about 6 hours even at room temperature. This doesn't work with ultra pasteurized cream. If the cream is ultra pasteurized it will be mentioned on the pack. You need to use 1/4 teaspoon for a cup of cream. Just mix the cream, sugar and cobasan, chill and whip till stiff peaks form. Information as given in The Cake Bible. Cornstarch : 1 teaspoon starch is added to 1/4 cup of the cream and heated till thickened, then cooled to room temperature. The remaining 3/4 cup cream is whipped till beater marks show distinctly. The cornstarch mixture is added to it as you beat again. Beat till stiff peaks form. Gelatin / agar-agar - Adding these to the cream changes the texture and gives a mousse like texture. I have used agar agar here. So, finally demonstrating my very mediocre piping skills, here is some cream beaten to stiff peaks and piped. No stabilizer added. Experiment with different brands, different kinds of creams to know what you like best. Useful post. Thanks for sharig. Can we do this process with amul cream? @Siri - Cream of tartar stabilizes egg whites when whipped, not sure if it works for cream. @Swetangi - Try Amul, summer may not be the best time though. Maybe early morning or late evening when its a little less warmer? Wow, fantastic post, very useful and informative, even i tried that cornstarch, but never with agar agar, i'll try it soon. Thanks for sharing, Suma. Very useful!! Have you tried Milky Mist cream? It whips quite well. nice work !! just now read your post on kiwi lime syrup and mascarpone cheese. i have successfully worked with whiped cream, i find it difficult to pipe , but i like the taste . i am based in U.S , i dosen't have much idea what type of cream is used in india to ice cakes . it taste very good and you can pipe flowers too with that. i think they use richs buttercream, could you please give your insight on this.